On account of it being a gorgeous evening; Eva, Breea, Della, and I walked to the girls’ favorite park and spent about an hour swinging, sliding, balancing, and climbing. 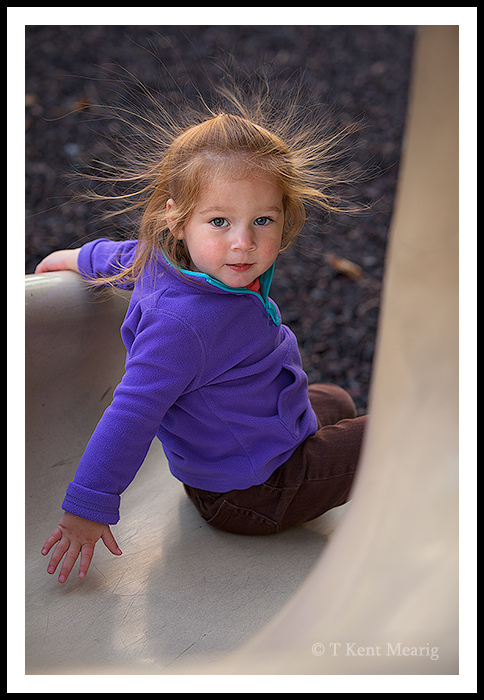 The highlight for me was definitely the wild hair that resulted from nearly every trip down the slide and the way Della’s hair in particular stood out against the dark play surface under the soft backlight. I neglected to make adjustments to my typical focus settings, and the 5d MkII already performs below average in that arena, so the number of photos with the combination of accurate focus and smiling faces was less than desirable. The moral of the story: I should be doing this kind of thing more often…we all should.